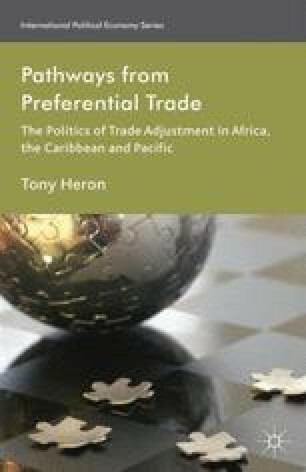 This book began by quoting opening declarations launching the DDA and the EPAs respectively — two separate initiatives offering an ambitious prospectus for redefining trade and development cooperation between rich and poor countries that have since foundered, or at least fallen well short of expectations. While duly acknowledging the different policy agendas, participants and political dynamics behind these two initiatives the aim of the book has been to trace a common institutional pathology they share with respect to the recasting of SDT. In exploring pathways from preferential trade, then, our aim has not been in the first instance to focus on the economic consequences of liberalization for countries in receipt of preferences or to make the case for their maintenance and the abandonment of trade reforms. Instead, our primary task has been to analyse the wider political implications signalled by these reforms, away from asymmetrical reciprocity and unilateral trade preferences to reciprocal free trade accompanied by ‘supply-side’ forms of development assistance. In other words, we are interested in how these reforms have played out in practice.